According to Business Insider, referrals alone from social media sites increased almost 200% from 2014 to 2015. Fastforward to 2016 and social commerce is hotter than ever, with social giants Pinterest, Facebook and - most recently - Instagram all taking the steps needed to become completely shoppable. As the pace of (ecommerce) change continues to accelerate, we've taken a step back to reflect on the retailers owning social media right now. In October, Facebook revealed a plethora of new commerce initiatives, including Facebook Marketplace and an extension of Facebook Messenger's relationship with online payments system PayPal. And now - fresh of the press - the social network has expanded the reach of its ads. According to Internet Retailer, Facebook is "running a test in which it delivers video ads on apps that run on set-op boxes like Apple TV and Roku through the rapidly growing ad network it calls Audience Network". More on that here. It's no wonder, then, that when it comes to social commerce Facebook has a reputation for dominating the pack - it scooped up nearly 65% of social network ad revenues last year, scoring a 1.85% conversion rate (according to Shopify). And it's not just the social network's new features bossing the retail scene. Facebook’s 'like' button has always created an immediate connection between brands and users, and the tool’s Newsfeed interface stirs a real sense of community - with video sitting next to pictures, words and social life - making it a great place to tell three-dimensional stories. “The more people buy online, the more people buy things they discover through their mobile phones, the more people discover things from News Feed and go on to purchase.” - Sheryl Sandberg, COO Facebook. ASOS' Facebook is a treasure trove of well-crafted content, such as this short video promoting the Asos Supports Talent initiative. Features both long-form and take-away content that is useful, entertaining and perfectly aimed at the retailer's main demographic. Delivers promotional material in a creative, engaging way; for example, 'Here's your debrief of the top 8 pieces the ASOS fashion team are loving this week." Bursting with colourful, stylish, high quality images that draw a reader in. On Facebook, brands are invited into people’s private lives and sit within their social sphere, so it’s vital that you set the right tone with your posts. As ASOS' Facebook page proves, retailers can create/expand on their own brand via social media, and move beyond the traditional retailer mould by offering unique, interesting content. Draw upon your USPs to set yourself apart from the competition. For example, the sports brand Adidas differentiates itself to other retailers by exploring the science and research that goes into its product range on its Facebook page. Don’t sell all the time. Facebook(ers) are hungry for entertainment. They want to scroll through their newsfeed and find easy-to-consume content that’s relevant to their interests. 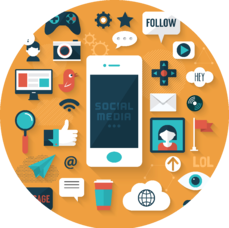 Deliver content that relates to your brand personality to keep fingers away from the unfollow button. Last month, Instagram took the ecommerce world by storm when it announced it was testing shoppable product tags on user's posts. With around 500 million monthly active users, the network is already an incredibly important tool to target online shoppers thanks to its focus on the visual, great userability and flexibility when it comes to advertising. One brand owning the photo sharing tool is J.Crew. 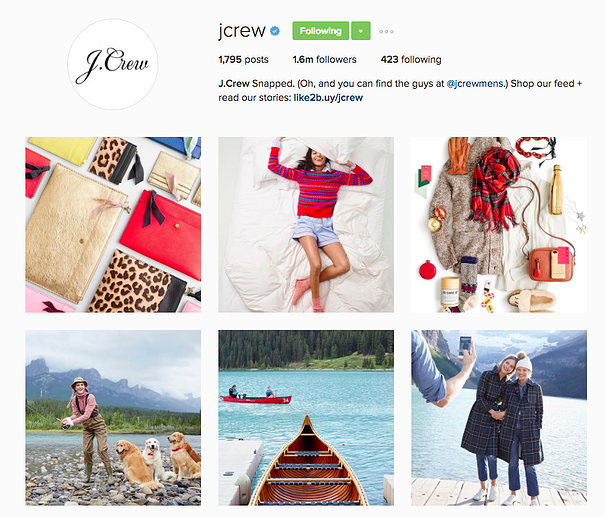 Along with the likes of Kate Spade and Warby Parker, J.Crew is one of the 20 retail brands Instagram has partnered with to start testing shoppable photo tags. Mixes stunning product images with informal, natural images depicting the J.Crew lifestyle - this tends to be outdoorsy, wholesome and fun. Includes plenty of social proof; from illustrators to fashion entrepreneurs, snaps of inspiring figures wearing J.Crew items can be found scattered throughout. Consistency. Even though J.Crew's Instagram page is seriously eclectic, all of the images are brought together through their: beautiful colour palette, high-quality and artistic edge. Keep it cool. Instagram’s magazine-style interface is designed for beauty. Make sure your pictures are well-crafted, high resoluton and look the part (or you’ll be out of the clique). Subtle product placement helps to showcase range at the same time as injecting brand image and personality. Encourage conversation. Sans links, sometimes the tool can seem very 2D. Make real efforts to engage with the audience beyond the tool to nurture a two-way relationship. Instagram presents an AMAZING opportunity to cultivate UGC, make sure you're actively encouraging and promoting it! Shorten links in post descriptions that can be easily copied and pasted into the navigation bar. YouTube is no longer a humble video-sharing site, it’s become a launchpad for the opinionated starseeker and a digital storefront for brands alike, with the addition of TrueView and shoppable ads. The latest episode of the series has attracted thousands of views with its funny, shareable and subtle tone. You almost forget you’re watching a branded video (however at times the products seem secondary to the plot). Combining great storytelling techniques alongside product demos and simple purchasing works. It’s funny, shareable and subtle. You almost forget you’re watching a branded video (however at times the products seem secondary to the plot). Don’t go viral for viral sake. Mastering the art of viral is a tough nut to crack, but if cracked, will propel your marketing message into the stratosphere. However a pants viral-first strategy with no clear link to product will flop and lose you respect. Build an engaged YouTube community and give them a reason to come back. Consistently produce content, stick with a consistent theme and make a clear actionable response to ultimately drive traffic to the buy button. Home of the vlogger, YouTube is laden with massive influencers. Pair with a loud voice in your field to extend your influence across various channels. Twitter may have backtracked on its 'Buy Button' initiative earlier this year, but the social media channel is still a big part of the social commerce conversation. ASOS Menswear is one to watch on Twitter, combining a mix of commentary and product-led content throughout its feed. Be visual. Photos make up around 45% of sent Tweets, but account for around 51% of all engagement. Make sure you produce eye-catching, colourful imagery that ties in with your message. Make use of Twitter’s updated content cards for mobile apps to explore deeper insights into user behaviour. Harness the power of influencers. Getting a simple RT from an industry influencer can boost impressions (exponentially). Don’t forget ‘Amplifiers’ - who are highly visual and engaged with your brand. Share content they want such as upcoming sales, discounts and promotions and links to exclusive content. Pinterest has become a major tool for retailers, driving 16% of social commerce last year through new buy and action buttons on retailer posts. Then, just a few months ago, the popular pinning platform unveiled "Shopping with Pinterest" (...find out more here!). Despite its CEO, Ben Silbermann, publicly declaring that Pinterest is not a social network, many use it to share, comment and participate in large communities (sounds social enough to us). 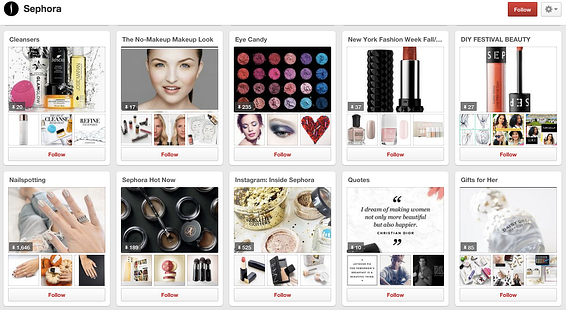 Beauty brand Sephora is one brand that has been ruling the (social) tool for a while now. The retailer posts sales, make up tutorials, featured items and promotions to inspire its engaged beauty audience. Sephora has also been playing its own game of social commerce in the style of Pinterest and Tumblr with its Beauty Board in a bid to boost ecommerce sales. The board lets users tag beauty products in photos that link directly to their ecommerce website, and integrates its existing Sephora online communities Beauty Talk, The Glossy, and Sephora TV together - giving it a formidable online presence. “Pinterest is the perfect venue to visually share shoppable new products, how-tos, and cool images. It’s a place to get inspired by beauty,” comments Julie Bornstein, Sephora’s Chief Marketing Officer. Use group boards and form strategic partnerships with influencers to bring fresh interest and conversation to your brand. Never waste an opportunity to marry your online and offline efforts. If you have a brick-and-mortar store - highlight popular pins by ‘pinning’ them on trending products in-store to bring your digital voice offline. Pinterest’s user base is 80% women and their top interests (on the tool) are fashion, home design, crafts and kids. Craft your boards to fit in with your audience. If you’re not a ‘Pinterest-friendly’ brand, use the tool as an extension of your brand personality, sharing culture and inspiration. Engaging visual content is key for brands looking to scoop up social shoppers, and as social networks continue to improve shopping capabilities, it's never been more important to get things right!